The year is 1979. The State of Ohio agrees to pay $675,000 to families of the dead and injured in the Kent State shootings. Vietnam and Vietnam-backed Cambodian insurgents announce the fall of Phnom Penh, Cambodia, and the collapse of the Pol Pot regime. Oh! And a little film by the name of The Warriors comes out in theaters February 9th and makes $22,490,039 in the box office. 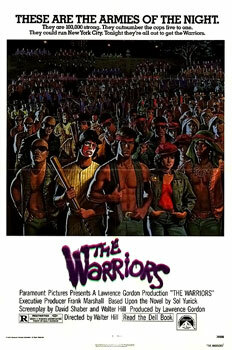 Directed and written by Walter Hill (Southern Comfort, Streets of Fire) and co-written with David Shaber,The Warriors is about nine members of a gang from Coney Island (New York) who go to the Bronx for a big meeting with all the gangs in the city. Cyrus, who is the head of the Gramercy Riffs, forms this meeting. His proposal is to make one big truce with all the gangs in the city so they can rule the streets. To them it sounds like a good idea, but what about the normal working class of New York? Do they have a say in it? Well, that doesn’t matter anyway, because Cyrus gets shot by the leader of the Roughs, Luther. And the not so lucky Warriors get framed for the act of violence. Now every gang in the city is after them, what can they do? Well, the only thing they can do, and that is to run all the way back to their home turf in Coney. But for the Warriors it won’t be so easy. The nine of them turn into eight, then seven, then six. In the very end it’s just six Warriors and a girl they picked up on the way named Mercy. But, do they make it? DO THE GOOD GUYS WIN!? Well, of course they do. You need a happy ending! It ends with a great song by Joe Walsh called “In The City,” and the credits roll! But wait! There is more to this film that makes it historically intriguing. Some of the background actors in the film were a part of real gangs, and before Roger Hill was cast, an ex-leader of a gang was hired for the role. But three days before shooting he disappeared, and no one heard from him ever again. Another gang related fact is that there were gang riots in some of the theaters that this film was playing in. Story-wise, The Warriors comes from a novel by Sol Yurick, which is loosely based on Xenophon’s “Anabasis,” the account of an army of Greek mercenaries who, after aligning themselves with Cyrus the Younger in the battle of Cunaxa (401 BC) in his attempt to seize the Persian throne, found themselves isolated behind Persian enemy lines. Before I go, I cannot forget to mention the awesome music score this film has. It really adds to the film and is one of the best movie soundtracks out there! If you’re into action thrillers and movies with lots of awesome fights, check this one out, it’s a “timeless” classic.